An e-mail allegedly written by Jenny Hayward-Jones, Program Director of the Myer Foundation Melanesia Program at the Lowy Institute, suggests a recent paper on Fiji was a strategy designed to expose Frank Bainimarama as the dictator he is to an international community that has lost the conviction held by Australia. Hayward-Jones, responding to a Fiji democracy campaigner, allegedly writes as follows: “The Fiji regime would reject the multilateral package of assistance for elections I have proposed but this will give Australia the clear evidence it needs to show Bainimarama will never restore democracy in Fiji and solidify crumbling international opinion against him. "Sanctio[n]s don't have a happy history of convincing bad regimes to resign. They have even less chance of working when they are not universal. I abhor what the Fiji regime is doing. "I'm also appalled by the damage they have been able to inflict on Australia's regional leadership and I wrote this paper because I think Australian policy can be more effective in helping restore democracy to Fiji over a few years. What is clear from the evidence is that current policy is not helping to restore democracy and may perversely be serving to entrench Bainimarama. But you don't need to worry about what I say. 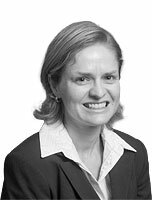 Prior to joining the Lowy Institute Hayward-Jones was an officer in the Department of Foreign Affairs and Trade for 13 years, serving in the Australian missions in Port Vila and in Ankara (Turkey), where she was Deputy Head of Mission from 2004 to 2007. She worked as Policy Advisor to the Special Coordinator of the Regional Assistance Mission to Solomon Islands from its inception in July 2003 and in 2004 and was a member of the election monitoring delegation in Solomon Islands in 2001. Jenny Hayward-Jones could not be reached for comment. Read her article Don't Ignore the Voice of Fiji's People by clicking on the following link, where she admits she was 'personally dismayed' to see so much support for Bainimarama in what appears to be an explanation, if not justification, for why the Lowy Institute published the controversial poll. Remember, the results of the Tebutt Research have been challenged by several quarters, including this blog, since its release last week at the Pacific Islands Forum. The strategy is good, the timing is wrong! "an international community that has lost the conviction held by Australia." OUT OF HER WITS, this lady. Fiji is regarded as a pariah state by the international community, especially the western states. you can't have honest surveys or polls under the present political climate. bunch of idiots. we don;t need your stinking polls. your institute's reputation has been ruined, assuming it had any. Wonder if she (they - LI director)ever considered the damage this monumental blunder would (has) inflicted on her patrons good name? Fiji will receive millions of dollars in funding for the sugar industry once it returns to democracy, says the European Union President Jose Manuel Barroso. Barroso said the EU knows Fiji is an important country in the region. “First come back to democracy, have free and fair elections,” he said reports Radio New Zealand. Is this wayward women having a nervous breakdown? Move on from not making the grade at DFAT jenny. Jenny, as sweet as she is, seems blinded to the realities in Fiji. As I often say of Academics, highly intelligent, not very bright ! They can read a book cover to cover and memorise every page, yet don't know how to tie their shoelace ! The poll figures are not correct !! Frank has much greater support than that shown by the poll !! Thats why all the ex-passengers of the gravy train can only rave and rant on blogs. No support in Fiji for them. Enjoying even distribution of rent monies thanks to Frank Bainimarama !! @9:50 PM. Good question Vanua. I guess not. Too dumb like that trash Sharon S.
WE DONT REALLY CARE ABOUT ALL THESE CRAP...DEMOCRACY NOW...PROTEST NOW IS THE ONLY ANSWER...GO FIJI GO....POWER TO THE PEOPLE. Mark Manning, you racist SOB. You should come to fiji and work with the real crusaders. Then you will appreciate the difficulties. Don't try to divide us on racial lines. 10.54pm - Another bit of nonsense from a banana suporter "enjoying the distribution of rent monies". ... which are a tiny drop inthe Fiji ocean of the ruin and decay under the junta corruption. There was plenty of coruption in the old system which we have high expectations of fixing in the new Fiji. Don't let any of the completely sensored, lop sided news from Fijis media fool you. TO THE FIJI MEDIA ...won't be long, just keep saVing those stoRies for when you are Free. about goverment's mandate & power versus the NLTB were ill advised. Several millions in soft loans to cane farmers were converted into gifts and $28.000 grants were offered to lease expired tenants at a time when the boards figures showed that $123.29 million was shared among 11.135 mainly Indian tenants compared with $7.4 million received in rent for the Taukei landowners with another $2.319.993 still outstanding". No wonder certain elements within Viti are hanging out for the EU money.